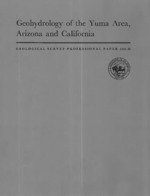 Annual summary of ground-water conditions in Arizona, spring 1976 to spring 1977; 1977; WRI; 77-106; Babcock, H. M.
Annual summary of ground-water conditions in Arizona; 1976; WRI; 76-59; Babcock, H. M.
McDonald, C.C. ; Loeltz, Omar J. 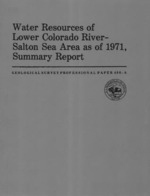 Water resources of lower Colorado River-Salton Sea area as of 1971; summary report; 1976; PP; 486-A; USGS NUMBERED SERIES; Water resources of Lower Colorado River-Salton Sea area; McDonald, C. C.; Loeltz, O. J.
Metzger, D.G. 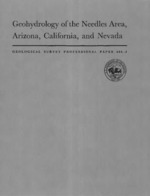 ; Loeltz, Omar J.
Geohydrology of the Needles area, Arizona, California, and Nevada; 1973; PP; 486-J; USGS NUMBERED SERIES; Water resources of Lower Colorado River-Salton Sea area; Metzger, D. G.; Loeltz, O. J.
Sandbar on the Colorado River in Grand Canyon deposited by 2008 controlled flood. 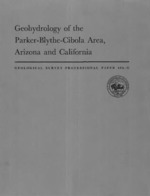 The river is flowing from left to right and the location is approximately 64 miles downstream from Lees Ferry, Arizona. Sandbar on the Colorado River in Grand Canyon deposited by the 2008 controlled flood. The view is looking downstream and the location is approximately 65 miles downstream from Lees Ferry, Arizona. More mesquite were visible, and prickly pear had replaced cholla as the dominant cacti. (Mitchel P. McClaran). USGS employees measuring flood flows on Rillito River in Tucson, Arizona. USGS employees taking flood measurements using an Acoustic Doppler Current Profiler. Measuring floods in Tucson, AZ 2006. Where in Arizona are ground-water levels falling? Where are they stable or rising? How much has the water table changed since large-scale pumping has occurred? (Flagstaff, Ariz.) An experiment using high flows from Glen Canyon Dam to study and improve Colorado River resources in Grand Canyon National Park has been proposed by the Department of the Interior. The U.S. Geological Survey (USGS) released a report today describing salinity levels in streams and ground water in parts of Arizona, California, Colorado, Nevada, New Mexico, Utah and Wyoming. The report concludes that although salinity varies widely throughout the region, levels have generally decreased in many streams during the past two decades. The U.S. Geological Survey hosted a two-day scientific workshop that drew state and federal government scientists, and university researchers together to discuss interdisciplinary research along the US-Mexico border. The U.S. Geological Survey (USGS) has recently released a new fact sheet/report describing investigations that have taken place in Lake Mead, Nevada and Arizona, on synthetic organic compounds. The U.S. Geological Survey (USGS) has recently released a new fact sheet/report describing investigations that have taken place in Lake Mead, Nevada and Arizona, on synthetic organic compounds. These compounds potentially can cause endocrine disruption in common carp. Recently collected data for endangered humpback chub (Gila cypha) in Grand Canyon suggest that the population of adult fish (age 4+) may be stabilizing after more than a decade of decline, according to biologists with the U.S. Geological Survey's (USGS) Southwest Biological Science Center. Today, June 5, 2006, the U.S. Geological Survey (USGS) announces the recipients of the third year of the Mineral Resources External Research Program, a grant and/or cooperative agreement opportunity designed to support minerals research. One of every four fishes in streams of 12 western states is non-native, according to a U.S. Geological Survey (USGS) study published in November 2005 in the North American Journal of Fisheries Management. What are the issues desert tortoises face, and what has been learned and accomplished?